Medical device maker NuVasive Inc (NUVA) posted a second-quarter profit, helped by strong revenue growth, and raised its 2008 outlook, sending its shares up 10 percent. Net loss for the quarter was $495,000, or 1 cent per share, compared with a net loss of $3.4 million, or 10 cents per share, a year earlier. Excluding stock-based compensation and amortization of intangible assets, the company earned 14 cents a share. Revenue rose 61 percent to $57.4 million. Analysts were expecting a loss of 5 cents a share, before special items but including stock-based compensation expenses, on revenue of $51.7 million, according to Reuters Estimates. 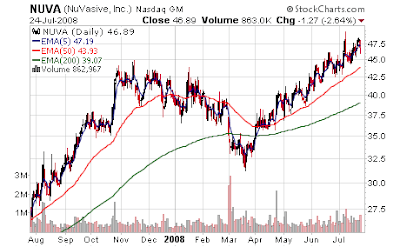 For 2008, NuVasive said it expects to earn 5 cents to 7 cents a share, excluding one-time charges, up from its prior view of break-even to 3 cents a share. Revenue for the year is expected in the range of $238 million to $240 million, up from a previous forecast of $210 million to $214 million. NuVasive is a medical device company focused on the design, development and marketing of products for the surgical treatment of spine disorders. The Company's product portfolio is focused on applications in the over $4.2 billion U.S. spine fusion market. The Company's current principal product offering includes a minimally disruptive surgical platform called Maximum Access Surgery, or MAS®, as well as a growing offering of cervical and motion preservation products. I really believe the dirty secret in this market is something I complain about weekly in the technology sector. There is very little serious growth (i.e. >25%) in the >$1 Billion market cap arena outside of commodities - we have a few pockets here or there, but most of those names are trading at stratospheric levels and/or reside in China or solar, where they get a P/E ratio of 8. And once you go below that size of company the risk increases substantially (smaller companies have potential for huge reward but many stumbling blocks along the way). So on one hand it makes it easy on growth investors to target stocks in this era because the choices are so few. But with so many "growth" investors piled into these names, the valuations make one dizzy. It will work, until it stops working. And then you get Chipotle'd. Or worse - Crox'd!